Toni Kroos has been a star for Germany throughout Euro 2016 and has been a dominating force for Real Madrid in La Liga. With an opportunity potentially there for him to make a switch to the Premier League – specifically Manchester City, the German star could not help but play coy. According to the Metro, Kroos has expressed a desire to potentially reunite with his former Bayern Munich manager Pep Guardiola – who now runs the show at Manchester City. He remained guarded on the issue of actually making a switch from Real Madrid to the Premier League giants but would not explicitly rule it out in the future. ‘I ruled out quite a while ago playing for a club in Germany again and this is still the case,’ Kroos said in a recent interview. ‘We’re in a tournament here where my total focus is on the semi-finals. 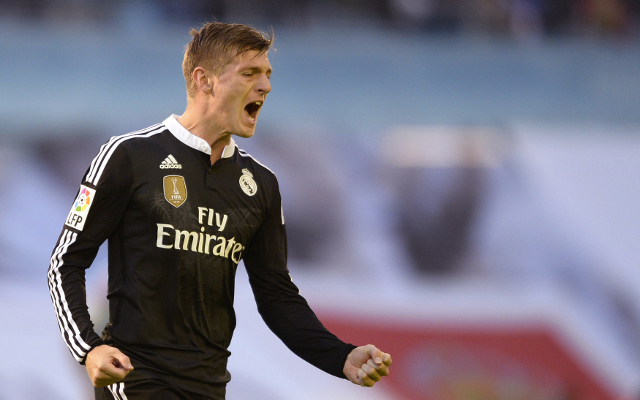 Kroos has been highly effective for Real Madrid over his past two seasons in La Liga. He has made 99 appearances in all club competitions since joining the team and has scored three goals with 21 assists. Under Guardiola with Bayern Munich in the 2013-14 season, Kroos earned Champions League Team of the Season honors and helped lead the Bundesliga giants to a league title and league cup title.